The free Sync Block Edit extension lets you easily update duplicate blocks of text in multiple files from Visual Studio 2015, 2017 and 2019. 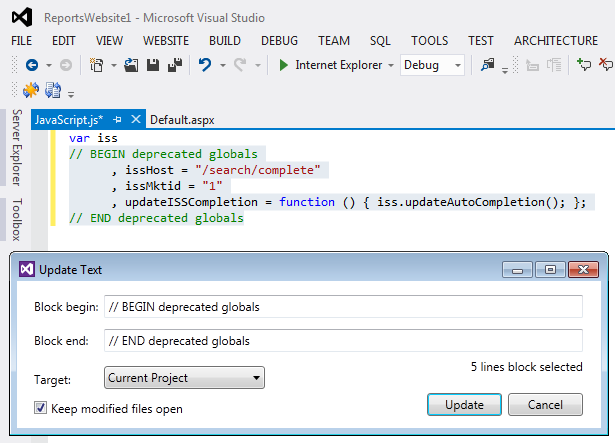 It performs multiline search and replace in Visual Studio with you only pointing what changes to propagate. It is undesirable, but often necessary to have duplicate blocks of text in multiple files. 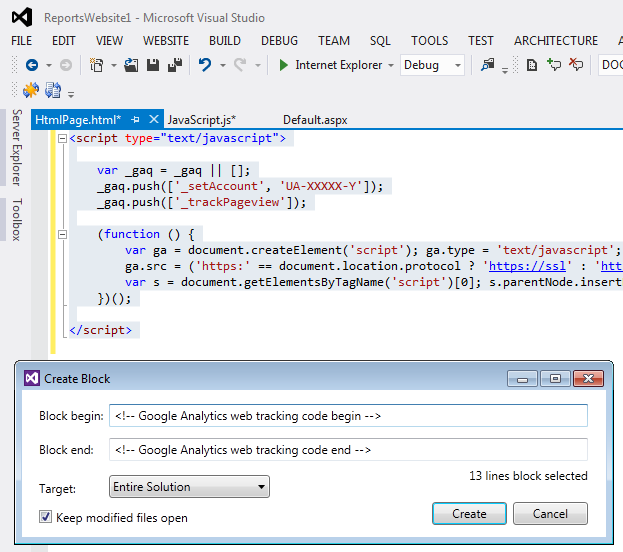 For example, Google Analytics tracking code in html files or copyright notices in code files. When you need to update this text, sometime you can do it with a simple search and replace. But when you want to make sure no other text is changed or when you want to add or remove lines, multiline search and replace is necessary. Sync Block Edit hides all the complexity of writing multiline find and replace patterns from you. In the Update Text dialog, begin and end lines are automatically filled. You select which files you want to update (target) and click Update. (Keeping files open lets you undo the changes, as usual.) In all files the text between the begin and end lines will be replaced with the selected text from the active document. In the Create Block dialog enter begin and end lines. Select which files you want to update and click Create. In all files this text block will be enclosed with the begin and end lines. After that you can update the block as described above.